All I had to do was hit the locals with a “Hola” and “Muy bien, y tu” and I blended in for 50 seconds. I took four years of Spanish in high school and never really thought my basic el bano, gracias, and por favor would come in handy. (Gracias Señora, Kinnaird). My travel partner, Kelli, and I met on a flight we worked one time a few weeks ago. We started discussing our schedules and it turned out that she had the same days off. So naturally, we began to plan a trip over the next course of days. We were torn between several destinations, but we came to the conclusion that we wanted to visit Mexico because one, it is super affordable, and two, there is sunshine and Mexican food! It was our first time to Mexico and we were eager to embark on a new adventure. We searched places that would offer the most Mexican feel, as far as culture and scenery. Our final pick was a gorgeous bungalow we found online in the middle of the jungle. We had no fear of mosquitos, snakes, bugs, food poisoning, or Zika. In fact, I am alive as I write this today. Catching a flight to Mexico was not so promising since the loads kept going down. We got to the airport and we were upgraded to first class. I started talking to a woman next to me who began telling me about her travels and history. As we continued our conversation, she offered us a five night free stay at a hotel she was trying to cancel. We could not believe what we were hearing. What are the odds you get offered a free hotel in Tulum, Mexico on your way there? We ended up staying in our booked reservations only because we wanted to stray away from the resort style this time. We wanted to stay somewhere completely different. We arrived in Cancun where it was torrentially pouring down rain. We had to catch a bus to Playa Del Carmen, and then flag a taxi to take us to our villa in Xcaret. Once we arrived in Playa, we were so soaked that we found a cute little restaurant and began feasting on our first round of guacamole. I then caught myself forgetting that I could not order water, which was rather depressing and dehydrating. We toured around downtown Playa on the hunt for a poncho to cover our luggage. Found the poncho. Wrapped the poncho around the luggage. Began rolling the luggage. Ripped the poncho. It was a mess, but we could not help but laugh. We found the shuttle to take us to Xcaret, where we were going to be staying. We got dropped off on the side of the road and then the next step was trying to figure out how to get to our place. Mind you, I had zero service so it was up to Kel to work her T-Mobile magic the whole time we were in Mexico. We arrived at our Mexican, beautiful, yellow, tropical bungalow after contacting our host who came to pick us up. It was stunning, even on a rainy day. We explored around the villa and instantly fell in love. We threw our bathing suits on and pranced around in the rain discovering true beauty in the jungle. We soon realized we were far from any type of convenience store/restaurants, so we lingered down to our hosts home. Our host was making homemade pizza dough and pastries, which they gave us as a send-off when we checked out. Our hosts had very thick Spanish accents, so they were not very well-spoken in English. They taught us more Spanish, and we taught them English, robotically. We awoke the next morning to crisp clear air, birds chirping songs, and the trees swaying in the wind. We stood outside on our balcony and took it all in. I have never stayed at a place so serene and zen. We looked down below our balcony and saw a beautiful breakfast set-up. So we went down to our breakfast and my-oh-my was it delicious. I will not forget the fruit blend and the nuts and seeds that were naturally grown from Mexico. 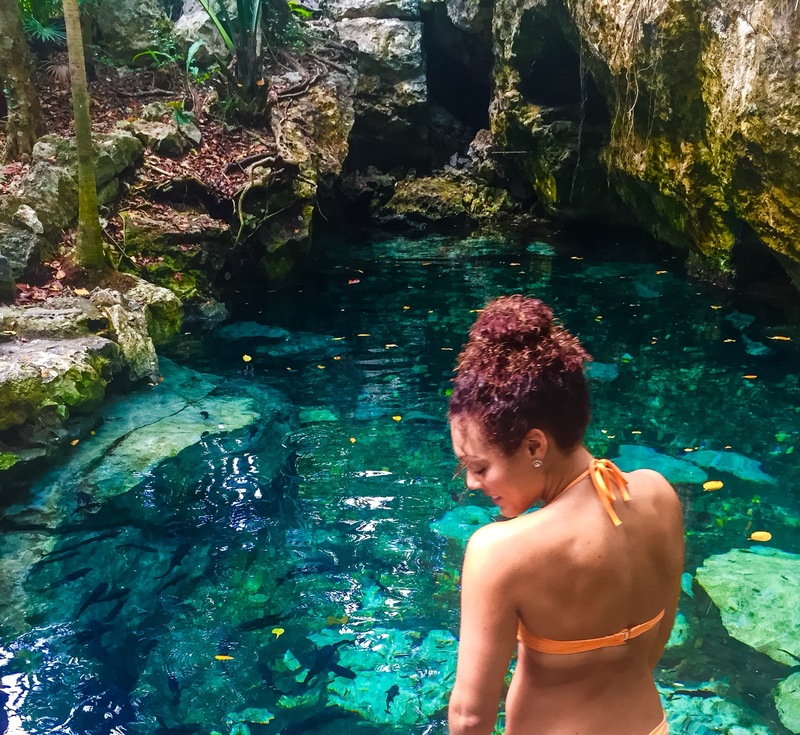 We then began to plan our day and started our hike through the jungle to Cenote Azul where we spent the day in the sinkhole composed of garra rufa fishes that gave us a free pedicure! It seriously tickled so much as they sucked the dead skin off of our feet. It took me forever to actually get into the cenote. There were fish everywhere including cat fish and it was just freaking me out. We had to throw sea salt chips on the opposite area of where I was just to get them away from me. Nasty little things. Eventually, I got more than knee deep in and overcame a fear of deep underwater caves, kinda, not really though. After visiting the cenote, we trekked our way to the road and began our walk to the beach. We visited an exclusive private beach and ordered a piña colada and mai tai’s at the bar. Then, it did not take much, but I convinced Kel that we just HAD to get a massage on the beach. And oh was it wonderful as we listened to the ocean breeze and waves crashing against the shore. We also attempted paddle boarding on one of the most windy days. I kept crashing into the reef and stepping on rocks. It was a complete fail for me, but it was kind of a lot of fun to try. Let us just say I am a pro at knee-boarding. When we got back from the beach, it was time to move onto our other reservation. This place turned out to be just as delightful as the first one when we were hosted by a French woman who made homemade breads. Her casa was Mayan inspired and it was absolutely amazing as our room was decorated in Mayan theme. The casa even had an outdoor shower, which was sooo cool! We eventually made our way to Tulum and ventured around the ruins. I was stunned by the ruins that overlooked the beach. That night we went out in Playa and experienced the nightlife. People were pulling us in every direction to get free drinks at their bar. It was as if vultures coming at us for food. Tan loco. Making zero eye contact somehow still attracted them more. We were tired from a busy day, so we got dinner at an amazing Mexican restaurant. As soon as we sat down, someone came up with a professional camera and took our pictures. Ten minutes later he came back with my face literally on a wine bottle. I asked to take a picture of the bottle, but obviously he wanted me to pay for it. Unfortunately, I did not come home with the bottle since I travel with a carry-on. We walked around Playa and had to stop to watch a woman and man who were singing Spanish music and salsa dancing. I must learn how to salsa dance one of these days! Since all flights were full and we needed to get back as soon as possible, we were desperate to get on any flight. Little did we know Mexico was on school break and other places around the country as well. So, we had to jumpseat back for four hours. I guess that is what we get for being lucky in first class on the way down. Our trip to Mexico was absolutely a blast. From the moment we arrived, we had an amazing experience. We had zero plans going in to Mexico, as far as what we wanted to do. All we knew is that we wanted to explore. Sometimes you just have to just go with it and hope things play out. Our hosts were unbelievable and the kindest. They treated us with such respect and made sure we always felt welcome. I truly enjoyed getting to know Spanish culture and being more familiar now with the language. I loved being able to pick up just one word out of a full conversation. Thank goodness for Mexican pesos, new travel buddies, and letting the jungle give back so much relaxation. My first trip to Mexico was amazing and I am so happy I was able to experience its culture. Buenas Noches, Mexico!